Since we bought our first home late last year, Kevin and I have had a constant flow of visitors popping in and out of our place in Atlanta. And with everyone visiting us, we’ve scarcely made time to travel as much as we would like since our last major vacation to the Dominican Republic for our honeymoon last year. That’s about to change. We’ve got plans to visit Charleston for a Couple’s Weekend Getaway in early September, and I’m working with a few fellow bloggers #girlboss on a Girls Weekend Retreat this fall too. So while I started thinking about our upcoming trip to Charleston, I realized just how grateful I am that Kevin and I had the opportunity to take a few mini-vacations before we tied the knot last year, AND just how important those trips were for us to really get to know one another. Meeting someone and growing a relationship in a set environment when you’ve got a stable job or a day-to-day schedule can be nice. There’s definitely a certain level of security that is comforting in that. But taking your relationship outside of the comfort zone that it’s grown in, and heading off on an adventure together someplace new gives you the opportunity to see each other’s adaptability in a new environment. Think about how your partner handles cultural differences? How your partner reacts to a varying schedule? Do they easily adapt to new adventures or is it tough for them to change things up? Here’s a great one to make sure you’re on the same page for your “vacation” plan… Do you want to stick to a more leisurely pace or pack in as many activities as possible? Depending on what your style of travel is, this might be a problem if you aren’t in agreement on the level of energy needed for various activities. There’s a big difference between spending a day at the beach lounging with a pitcher of piña coladas versus a day hike in the mountains. Speaking of energy, when your partner gets exhausted this will be a good chance for you to see how their level of patience coincides. Do they get tired and quiet when they run out of juice and need to recharge during the day? Or do they push through it to get the most out of every minute? While you may already have a good understanding on how you deal with financials in your day-to-day setting… whether it’s splitting the bill or having one partner cover the entire expense, traveling together will give you a better understanding of your partners’ spending habits and what they see monetary value in. It’s important that you both understand where each other’s priorities and financial limitations lie, which is where clear communication and openness is key. In fact, it’s probably a good idea to discuss financials prior to the trip to make sure you have your budget prepared. Hopefully, by planning a trip with your partner, this means you’ve already established some common interests with each other in order to be in a relationship in the first place. 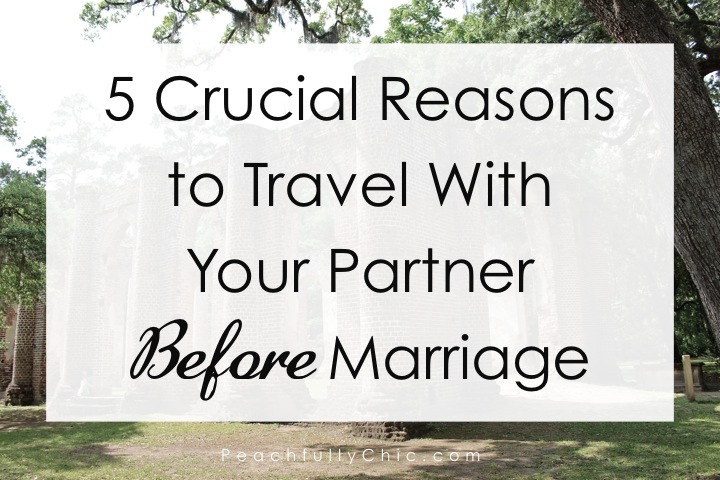 But traveling with your partner allows you to see dig deeper and spend much more time with them. Do they appreciate the scenary as much as you do? Are they taking in the experience in the same way? Are they enjoying all aspects of the trip or do they nit pick about what might not be perfect? And if they aren’t interested in exactly the same things you value to make it a great trip, Are they willing to compromise so that you both enjoy the time? Shared experiences are the basis of any relationship. So traveling as a couple will give you even more unique stories and moments that build on that special bond you’ve already created. It’s not just about enjoying the moment, but the lasting memories you will remember and think back on! While physical pocessions are fun (especially when it’s the latest Rebecca Minkoff handbag of the season), traveling and creating unique memories are arguably much more valuable. And throw on a built-in travel companion that you can share those memories with while building onto your relationsihp… who wouldn’t love that! So get out there and take a trip with your partner. You’ll realize that it unveils a lot more about their personality and your dynamic with them by breaking out of your routine and exploring the new, which is why traveling with your partner is a must for anyone before marriage! If you agree/disagree or have any other perks of why it’s important to travel with your partner before marriage, share your thoughts in the comments below! You share such unique tips with audience that can be helpful for every couple to getting closer each other before marriage. That is so helpful. Thanks for sharing! !